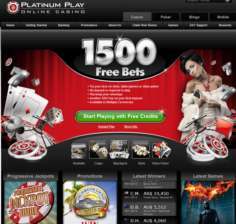 Platinum Play Casino offers their players a truly amazing online casino experience. They provide a fun, realistic atmosphere, loaded with games, and overflowing with great bonuses and promotions. 400+ games fill the lobby, and almost 40 of those are blackjack games! The loyalty program is great, and the bonuses are extremely generous. This is another fine Microgaming casino we can all enjoy. Casinos powered by Microgaming software are good for blackjack lovers because they offer so many great blackjack games. They are realistic, they play smoothly, and they never get bogged down with flashy sounds and graphics – everything seems to be just right. 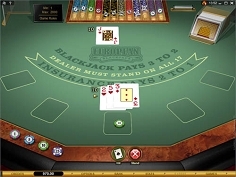 The downloadable casino suite is quick and easy to get running on your home computer, and the no download version requires no set up at all – just get online, anywhere in the world, and start to play. How’s that for convenience! 40 is the magic number at PlatinumPlay Casino – that is how many different blackjack games they offer! Some of these are ‘repeats’ because we consider Atlantic City Single Hand, Atlantic City Multihand, and Atlantic City Gold to be 3 different games, even though they are all quite similar. But in the end, however you count it, there are a lot of great, classic blackjack games here to enjoy. Don’t miss the Triple 7’s Blackjack for your chance at a huge progressive jackpot! There are hundreds of other games at Platinum Play Casino to keep you busy while you take a break from your favorite blackjack game. You’ll find the usual range of card and table classics, along with a stout selection of slots and video poker games. You can also play a couple kinds of Keno and Craps, along with a big range of Progressives. The selection is truly fantastic. And to top it all off, the casino has written game guides for each kind of casino game, and has placed them online to help their players out. The first bonus new players come across at the PlatinumPlayCasino is $400 double deposit bonus. Claim your 100% first deposit bonus up to $200, with another 100% second deposit bonus up to $200 (available in multiple currencies). These are great bonus giveaways because Platinum Play’s bonuses can be withdrawn after wagering requirements are met, however Blackjack barely counts towards the bonus playthrough requirements. Friend referrals land you $100, which is a very generous bonus! There are lots more promotions available, just check Platinum Play Casino website for more info. Platinum Play Casino is overflowing with goodies. Their game list is huge, and they have a great variety of blackjack variations to choose from. Their bonuses are very generous (but not very blackjack friendly), and the regular tournaments they run can be a lot of fun. All in all, this casino is among our top-rated for blackjack fans!